Jeremy Lin had a mini-breakthrough in his 7th game of the season to regain his rhythm and shooting. He finished with season-high 12 points, 8 asssists, and 1 steal in 24 min. In the post-game interview, Coach Lloyd Pierce offered praise for both Trae Young and Jeremy Lin in a question about Trae’s performance. Lin had a bit of a scare when he was hit during a layup in the third quarter and was seen to hold his knee afterwards. Trainer Chelsea Lane immediately checked on Lin afterwards. It remains to be seen if the Hawks will be more cautious to limit Jeremy’s playing time below 20 minutes as a precaution in the Kings game tonight. 💗🎙️🎶@JLin7 latest RAP《Why》singing his basketball story. I am waiting for highlights of Lin for tonight, thanks. So far, 75% of Lin fans expects him to play 10-20 min after a season-high 24min and a bit of knee scare after the fall. It’s good to not burden his knee too much, too soon. Pray to Our Lord that Jeremy Lin’s comeback will have a happy ending, Amen. Go go JLin. Do your best and the rest will come! Pray that you continue to stay healthy. Support you no matter what! How about Lin highlights from the past, for now? Pregame Warmup. 03-01-2017 Nets FIRST WIN after losing Lin, going 1 and 27. On the road, vs Kings Lin, 3rd game back from second hamstring. Minutes restriction. 19 mins, 17 pts, 5 assts. @ 5:10 – opposing commentators: Lin makes a big difference, to have a leadership guy that has played on winning teams. Oh heck, just watch the whole thing! THAT LIN HAIR – LOL!!! Yes, what’s notable about the LP comment was that the reporter only asked about Trae. But LP voluntarily added support for Lin. It’s just words, not action yet. But still, miles better than BS Scott and McHale. Lin, the Chinese rapper. Another career goal? Haha. Hope Lin gets 24mins today. I am hoping Trae get injury this game. I know is not good to say that but hey he is a rookie that have a franchise invested on him, so why not give this year to Lin? Lol. And LP sub other in but seem like no Lin. Unusual for him. But they may have scouted him well. A minor sprained ankle won’t hurt lol. Yeah but still no Lin. 4 now. Wow they gave the TO to Lin. Smh. Yeah, we don’t really hope for that. Foul trouble is cool though. I have a feeling is going to be a good night for Lin tonight! Haha. Me too, It happened to me 3 times. Not fun at all. But if Lin can play then… hehehe. Lin has more of a loping type of gait now and he’s quite upright. The work done with Fortius shows clearly. Nice drive and layup. He’s beginning to finish through traffic now. So Prince getting lots of assist and Lin missing FTs, weird game. Yes was surprised Lin missed both. Lin fouled. That’s not a fair TO to give Lin. Now he has 2. Lin’s 3s just aren’t falling. Glad he didn’t hesitate on that shot. Were they short or too strong or sideways? Didn’t see. side and too strong on the last shot. he needs to make his free throws. He was hit from behind and that jarred the ball loose. Lin need to work on his ball handling. Sacramento is totally outplaying the Hawks. So many turnovers. they are letting prince run the show…he’s not a playmaker. Bembry is like a full speed train! Bembry holding the ball too long. Good stint from Lin. He’ll be finishing quarters if he keeps up this aggression. Len should catch that one. I am hoping for a close game this time tho. Forgot Hawks are playing tonight. How did our boy do? Lin 8 pts in 8mins, Mr. Efficient! Awesome! Got 8 pts in 8 minutes! He’s getting minutes with Trae and starters not playing well. 🙂 He’s resting now though. well thats up to his teammates. play selfish or not? So far okay, just too many TOs. I don’t like Trae that much but he is not a selfish player… yet. Starting to see why Bazemore should be traded, out of shape and slow. Wish coach would bench him for Lin. Trae Young can’t hold Prince and Bazemore accountable, those two want to be the main guy over him. Lin, Young, Prince, and Bazemore can work but Young needs Lin’s help in leadership! No one’s going to listen to a rookie no matter how talented he may be. Lini s talking on the bench with John Collins. LP got nervous protecting his starting PG. Sitting Lin for now. Yup, and he’s just cruising, getting to the rim but controlled without being too dangerous. He’s relaxed! Once Lin led bench for a small comeback, starters finally woke up and it’s a 3 point game! Hope coach will play Lin more this game! Bad closing and defense by starters, Trae went for the layup, and no one went back for defense! Huerter has an ankle injury. I don’t think he’s coming back in the game. Yes Bench Force One but I still hope for Lin to start. It’s obvious starters slack off on defense. Trae Young having a hard time playing with Prince and Bazemore who only goes for selfish iso! Honestly if coach starts Lin as SG and Young as PG with staggered minutes it will work much better! Looks like he’ll be out a few games from what I’m reading. One thing I don’t like is when Bembry brings up the ball Lin goes in the corner and stays in it for a long time. Lin should get the ball from Bembry when he brings it up and Lin should direct the offense. LP said yesterday Trae and Lin are their 2 facilitators. that’s not bembry…. that’s LP’s coaching. But I think Jeremy is beating the system by driving to the lane when he gets a chance. Hawks starters are so bad tonight. No defense whatsoever. actually their starters are bench players. The real starter is sitting. Coach is mad at his guys during that timeout. Lmao no one box out?????? body language is soooo bad. High scoring game. You live by your offense, you lose by your defense. These refs are seriously terrible. Lin’s getting the ball to the bigs but they’re hesitating. They have to go up strong once they get it from Lin. Ouch. Just checked the score. What’s up with the Hawks and third quarters? Like the way the Nets were when Lin was with them. By big I think you meant Dedmon. He is hesitating big time. Dedmon first. He was taken out and I think Spellman or Poytress didn’t convert the shots. JLin with the and 1! Doing so well, if only his teammates were less selfish and had starter minutes! Coach’s trend is, team losing, play Lin and bench more lol I don’t mind! Lin did fine. He’s progressing nicely. It’s good seeing Lin get more consistent minutes. Too bad the nice passes and setups for his teammates go wasted. His 3-point shooting still isn’t back, but his speed is about 90% now. You can see the vision and confidence back in Lin. Lin is getting to the rim at ease again so I could care less about his assists! Coach wants him to pass more obviously, Lin should just ignore that BS! Those Kings lotto picks are paying off. They’re destroying the Hawks. Talent is there but so many refuse to play as a team especially the starters! Nothing can save them if starters dig a hole every night! Young can’t make Bazemore and Prince to look for his open 3s they are only looking for their iso shots! Lin at least only needs to deal with Bembry/Prince one at a time! Wow, sounds like Dominique Wilkins is a big fan of Lin now. I guess, when he’s part of the Hawks, then it’s all compliments. That’s very unlike the guys in Houston, Clyde especially. Lakers should have taken D’Aaron Fox! Great answer by Lin when asked about mentorship with Trae. Summary: I won’t describe our relationship as mentorship, that’s more 1 dimensional. There’s definitely things that he can teach me and I have years of experience that can get him up to speed. Hawks announcers really like Lin, “It’s Lin’s night today, 13pts in 14 minutes! these bigs are not tough enough. Len thinking, “Get me off this lineup up please”. Starters = Iso everyone for themselves. or was it coach LP saying that recently? Len is tough but he’s not going to work hard if teammates aren’t rewarding him with shots! Why work hard on defense when everyone’s just going for iso? Lin should get all his minutes with Len! Lob-City all day! so will coach LP say that “we’ll take that all day and everyday” with Trae’s numbers? give Lin 5 more minutes and he’ll get his 20 pts. I’ll take the Hornets any day. I hated Houston. yeah…Trae can do no wrong it’s his team. You kidding right?! Lin was the scapegoat for Mchale all the time and yanked around while stuck at the corner for every possession! That was NOT Fun! You bet! Lin getting his swag back! Coach giving him fair and more minutes every game! eight games into the season and let the tankathon begin! That’s the trap of being on a bad team. Think only of your own stats and play losing basketball. Lin does not give into such temptations. He lives to win as a team, it’s his happy place so he won’t be looking to just get his. and as Jeremy’s fan, we know never he has any thought like that. NEVER, period! He was. But Lamb was pretty good and there was some depth. I liked Lin with Big Al. Any intelligent, fair coach would’ve taken the Harden, Howard, Lin rockets 🚀 to the championship. Lin back in with the starters! woohoo! Time to win the game!! Don’t call Lin a mentor! Geez, 8th turnover for Trae. I hope Lin’s 3s start falling soon. That one was long. He’s not really getting a lot of touches. Starters are horrible, not even taking out 2 starters can save them! Let Lin be the PG already! damn, Lin can’t buy a 3 for nothing. Trae benched woohoo! Lin closing this blowout loss! I’ll take it! Come on Lin! 2 missed open 3 pointers already! Lin, move in some. Take some mid-rangers. Lin can’t hit a 3, but neither can his teammates. Hawks are 6 for 25 (24%) at 3 tonight. Meanwhile, Kings are 40% at the 3 tonight. That’s all starters practice! They don’t know how to pass for teammates’ open shots to save their lives! come on Jeremy “Brick” Lin! Too much adrenalin. I think he had time to take a dribble on both those missed 3’s. Too excited when teammates finally look for him on open 3s! man, Lin been missing wide open 3’s. strange. I think he’s missed 2 3s so far? Probably not used to the longer minutes, no more jump in legs? 0 for 5 at the 3 for Lin, with 2 open 3s. 3….! Finally after two misses! finally! do we get free tacos? Team high scorer… but team low +/-. Starters are horrible on defense and selfish offense, Fox feasted on them the entire night! No one cares about +/-, Announcers were praising Lin saying it’s his night today so whatever. Hawks horrible starters, and blowouts = more minutes for Lin, awesome! More minutes for him to get back in shape! Lin is very close to 100%! King’s defense is pretty good. This is embarrassing. I’m usually unfazed. Even I’m embarrassed. Poor Lin, caught in the middle of the bad starters and the 3rd stringers. Even if he did miss 5 three’s. Huerter left with injury. He might have been able to help with the 3 point shooting. Nice! Lin with 21 points in 21 minutes played! 2nd 3 of the night. Lin was wide open again. Another 3 and Lin has 21 pts! woot woot! Go for 30 please! Even Fox Sports is embarrassed. They just cut the TV LP feed. LOL! Lin made two 3s. Hawks have to give out free tacos! All bench plays as a team with Lin as PG! Starters are trash cause Trae can’t hold Prince and Bazemore in their place! So glad Lin doesn’t have to deal with that nightmare! This is exactly what I wanted to see. Lin padding some stats and getting his confidence, vision, and passing ability back. He’s even hit two 3s at the end. Lin with the steal and 2 more pts (goal tend)! haha ! woohoo!!! Game over so who cares just look to score! Lin pouring it on now lol. Great night, even if Hawks got blown out! espn boxscore is always a little behind. man Lin! you’re just a zam stat-padder! Hawks blown out = more minutes for Lin & bench. I’ll take it! Coach tried getting Lin to save the starting line up but Trae and starters are so bad he just benched them at the end since it’s a blow out! Can tell Lin holds bench players accourtable and they actually pass back to him for open shots! Bazemore and Prince are too selfish to look for Trae, he’s on his own. it seems like lins speed is 90 percent. am i wrong? He’s getting faster. The acceleration isn’t quite there off of the first step. On defense, he was staying with most of the young players. That’s good to see. That’s what I said before. He’s not 100% yet, but he’s close. Plus, I don’t want him to go all-out this season. Not unless Hawks can pull off a miracle and get into playoff contention months from now. This hawks team is basically the dleague for lin.. he just has to show up get his stats and get drafted to a real team next year. Still possible but there’s too much disfunction with starters. Unless coach starts Lin with staggered minutes it will be a tanking season regardless of how much Lin scores. Tank + Lin minutes and stats I’ll take it if that’s what Hawks are going for! Even before the blowout started, Pierce was subbing guys in and out of the line-up. Wonder how many different line-ups he ended up using. It was the same complaints last year with Kenny. Playing too many (LP today – 10 in rotation). That can impact chemistry of the bench. you are right. I agree. Just keep scoring. Bench was completely fine with Lin as PG! Starters were the ones digging the hole all night! Coach tried different lineups to save the starters even subbing in Lin earlier for 4th with them and it didn’t help! Lin didn’t get to handle the ball with starters and Trae and everyone just went for their own shots! So glad it only took 2-3 minutes before coach took rest of the 3 starters out! for me id say play lin more then bremby. Collins is needed because Vince isn’t a starter anymore. trea should play off the ball a little more. mostly because he is great at threes. pnr have him there on the weak side waiting. Yup! Best part coach will give him more minutes for blow outs unlike other teams who pad their starters’ stats in garbage time, win-win! If Hawks are tanking while allowing Lin more minutes as main PG for bench! Lin on Hawks’ offense is much more fun to watch! Almost total control as the bench’s PnR PG unlike the Nets! Lin x Trae can work with Lin setting Trae up. My prediction is that coach will try Lin as starting PG/SG soon with staggered minutes leading the bench! Trae, Bazemore, and Prince are obviously not getting along. Those two obviously doesn’t like how Trae is made the new franchise will only look out for themselves; selfish. Only Lin can help save Young from those 2 disasters. Unfortunately, I think the Hawks are trying to develop all the young guys, including Bembry. Hopefully having Collins back will help with the starting line-up. Then why give Lin majority of the minutes during blow outs? Announcers were also praising Lin and they showed his interview during half time! Lin’s role on this team will reveal itself soon, he’s more important to FO than everyone thinks! Hawks have talent but they need a true PG/SG like Lin to help lead them! Trae just not experienced enough to garner respect from Bazemore and Prince it’s clear as daylight. bazemore is more of a defense and 3 guy. he isnt that good but a useful player. prince is way overrated. very unreliable to me. Prince worse than Baze. But, honestly, it’s true. They don’t exactly pass to Trae either. There was one play that I remember that Trae was also wide open for a 3. Waving his arms. Ball didn’t go to him. Is that Pierce’s scheme? Can’t believe he’s allowing this to go on. He has some talent physically. But mentally, he plays an awful game. Worse than Bembry. Bembry is every so slightly improving. Huerter was also hurt and left the game. That could have added to Lin’s minutes. Hey, I’m not complaining. BUT I ALSO WANT TO MAKE SURE LIN DOESN’T OVERDO IT. STAY HEALTHY! It was his night. He’s a pesky defender and he’s young, great motor. Lin was just crusing, didn’t overdue anything and laid back on defense when he could. He’s improved and doesn’t over help on defense anymore, also looking for his shots more, nice! Trae and Lin can take turns feeding each other there’s no doubt about that. Problem is Bazemore and Prince not passing for open shots and Trae’s horrible defense. Could be, maybe he’s doing this to humble Trae a bit if so I’m all for it! It was weird though. I thought Trae had a couple of open 3’s that he didn’t take. Instead, he drove to the rim. Maybe Pierce wants him to work on that part of his game, instead of just chucking? I would say the whole team was horrible at defense tonight. Except Lin. Got back in transition. GREAT BLOCK on a bigger guy! This is exactly what I wanted to see out of Lin this year. I’m glad he’s finally woke up and realizes that this Hawks team is too selfish and disorganized to make sacrifices for. He needs to look out for himself and stop worrying about everyone else. Prince flashed during preseason and then turned into a ball chucker during regular season. Even Lin can’t get him to pass, thinks too highly of himself. I’d rather Hawks keep Bazemore and benched Prince! At least Bazemore would pass back to Lin but Baze is so out of shape. Bottomline if coach will starting Lin, Trae, Bazemore, and Prince and it doesn’t work, he needs to bench either Baze or Prince. Nothing to do with Pierce, Trae not confident enough about his 3s when closely defended. He needs teammates to set him up for 3s and no one will do that for him on the starting lineup! That’s not going to happen for Baze because they need to build him up to trade him later on. And Prince, they need to find out whether he can be a legit second option scorer. So that’s why all the links went dead and I was stuck with a blurry feed? Trae WAS open on the ones I was referring to. But good point about playing Lin and Trae together for some minutes. Could work. But it would be very small ball. Could depend on matchups with other teams. It worked somewhat with Kemba and Lin. Kemba improved significantly the year that Lin was there. But, don’t forget, Lin also helped out on defense to bail out Kemba too. Right now, Trae is far from where Kemba was. Seems Lin gave the team a pep talk. Fox Sports giving Lin some love at half-time. That he always give very thoughtful answers. Rathburn & Wilkins too. Well, at least until the blowout started. Then they were busy talking about their snacks….LOL. Lin always political but also sincere at the same time. He’s very good at walking that fine-line. Notice how Lin doesn’t call out orders and try to do too much or over pass anymore. Just a slap on the hand as encouragement and looking to get his shots. This is how he should’ve been playing all these years! Only took 7 seasons of being traded for Lin to finally wake up! ATL is a bad team and/or they have a bad coach. Blown out by Cleveland and now Sacramento? These are not very good teams. What is ATL going to do when they face good teams? They alreadt played an overrated PHI and got blown out. It,is early and nothing means much until 20+ games has gone by but ATL looks very rough. Coach and front office talk defense but ATL gives up,way too many points. Even an injured JLin looks like a defensive ace compared to his teammates. Technically it was a blow out even when they were praising Lin lol. Even Atlanta’s announcers are better than Nets! Nets’ announcers never praised Lin at all. This is not the same Kings from last year. They’re now 6-3, which is good for 5th place in the loaded Western Conference. Sure, it’s only the beginning of the season, but the Kings are loaded with lotto draft talent. These college stars are hungry, energetic, and very skilled. The loss to Cavs on a back to back was bad though. No excuses for that. Philly is just a good team, so no shame in losing to them. Pierce is a rookie head coach. Most rookie head coaches are terrible and many don’t last in the NBA. Also can’t blame Pierce that much, since the Hawks are a very young team and had starters injured to start the year off. Lin was also not 100% to start the year off, which hurts their bench tremendously. Not making excuses for Pierce, since I don’t like how he benched Lin for so long and allows the Hawks players to play selfishly, but you gotta keep these caveats in mind when analyzing this team and coach. They do need to really step up on defense though. It’s horrid, disorganized, and nonexistent most of the time. Who hasn’t played defense? Baz always plays defense. Prince has the size to defend. Only Young couldn’t defend anybody even if he wants to. Dang, Lin got really real in this interview. He went deeeeep for a post-game interview. You don’t see this kind of in-depth talk in the locker room after games. He puts things into perspective and laid it all out for the media and fans to think and talk about. This team needs to play their veterans more. They can show case Bazemore from the bench! At this rate they won’t showcase him at all on this tanking team! Coach needs to change the starting lineup with Lin as PG/SG. Try the lineup with Bazemore and Prince with Lin and Trae for the one game, if it fails, bench one of them or both, the end! Loves Jeremy stats, but he still needs to figure out his 3point shot. Missed too many wide open shots before the game became a blow-out. Maybe if he had hit those, could had sparked a bit of a come back. Start JLin, Bazemore, Len/Dedmon. See what happens and go from there. Play the rookies and sophomores in back up roles like used to be done. Try to win, not “tank’ or “develop” players and see if this old fashioned system doesn’t teach young players the right way to play by watching seasoned pros play the game. Lin’s points for the game on Saturday. HAHAHAHAHAHA! Even better, maybe they meant +/- PLUS 95! Need a good laugh after that embarrassment! Also it was a smart decision by coach/Hawks to build up his minutes. At least his minutes are build up faster and he’s allowed to play his game unlike KA and the Nets! Still holding hope of Lin starting! i think hawks may have no choice. baze and prince are not doing that good. baze may be traded. vince shouldn’t be starting. i think he will start at some point. Add a short rookie point guard in the most important position, and it’s all downhill, not in a good way. Coach is treating him well enough, he might not get the same minutes and playing freedom on a different team. Lets see if coach and Hawks will give Lin the start alongside Trae. Hawks have talent just need a PG like Lin to help lead them. Trae has talent but he’s a rookie and won’t get respected by anyone even if he has the green light. Given Click’s caveats. What on earth are they doing in practice? i like the promise of lin and trea. just depends how the hawks view lin. now he is almost 100 percent we will see. Cleveland is a sinking ship after Lebron left, now JR Smith wants out too. No Lebron and Irving, no star to lead the team anyway for years to come. Lin to Cleveland? No, just kidding. He would HATE all that snow! Well Lin’s 3s aren’t there and from this game today he’s probably only at 90%. We’ll see. I’m hoping coach will do a starting lineup change with Lin next game or very soon if not it’ll be a losing streak. It’s already 3 losses, how many more do they need….At this rate they’ll fall to the bottom of their division. i think lin has to over take bremby first. then they have to use him and trea differently. till i see lin as the ball handler and trea as the shooter, they will never reach there potential. this starts and finish with baze and prince. they are simply not ball handlers nor good enough to be second options. Come on Hawks. Brand new arena but can’t put some oil on those squeaky hinges? Annoying! It was even worse in that Tencent interview that Click translated! I have to go back and re-listen. Which part? They just extended Bembry’s option. I doubt if it’s to sit him on the bench. LP Postgame – haven’t listened to it yet. Well, they did get back within 5 at the half…. Bembry is playing on the bench regardless. And Bembry did pass to Lin for a cross court open 3 today which was nice. I think he’s warming up to Lin. Not sure if Lin can change Prince and Bazemore. Either way the coach can experiment a lineup, modern basketball is very flexible. Just move Bazemore or Prince to the PF with Lin as starting PG/SG with Trae. Keep Len as the center of course. I would agree that there seems to be effort, the Hawks had 6 blocks as a team. But when they shoot 48%, but still lose by 31 points……it’s BAD defense. I agree that Young is not a good defender. But, not sure it should all be blamed on him. I’m as happy about Lin’s postgame locker room talk as I am about his great offensive game. He’s showing leadership and Pierce is letting him do so. Tanking or not, this Hawks team needs a kick in the pants. Too much laziness on defense and selfishness on offense. I just hope Lin can show his stuff, make his mark and then be traded to a playoff team at the deadline. Tonight was a big step forward. He’s on his way back! But I don’t see it these days. Seems like high lottery draft picks rarely come off the bench. The GMs stake their reputations on making sure their picks shine, not necessarily the team. I’m still not clear on how many minutes he wants to play Lin or if there is a plan to get him progressively to a certain amount of minutes. It almost seems like he was saying Lin got more minutes than his usual. But I’m not sure. I think Dorsey plays for Huerter. He often doesn’t play but he played decently tonight. I think Prince and Trae get a lot. Around 30. Not sure about anyone else. Maybe Baze gets 30 too if he plays decently. Baze was playing frustrated for most of this game. He seems out of his funk and is now Lin, the engaged Hawk. He sounded like a Hawk tonight. He’s not a 6th man, he’s a backup. I hope that he plays out of that. But it’s only game 8 and he’s made so much progress even from game 5 or so. Or Lin can stay, he has a trusting coach willing to let him play his style of basketball unlike other coaches including KA! If Lin breaks out this year and Hawks give him a 3-4 year extension he should stay! Good coaches are hard to come by! Unless another team offers Lin more money and a better contract. I like Pierce as a coach a lot more than KA, Cliff, Mchale. I’d go far as to say he’s the 2nd best coach Lin’s had since MDA! Haven’t seen Lin get this much green Light since Knicks days. All that’s missing is Lin getting the starting role and 30+ minutes. there a chance he will get a shot to be a top guy on the team but we will see. And we have seen this happen for about 3 games now. Coach does what he says he’ll do. Not afraid of benching starters either. It’s up to Lin to turn this 1 year rental into an opportunity! Trae can handle the ball too but he needs to look for Lin’s open shots and vice versa. If Lin gets to play PG with Trae off ball, it will be when he gets the starting spot already. Hawks Official Twitter about the final score: “Hawks: Less. Kings: More” LOL LOL LOL! Surprised that Pierce revealed what JLin said in the lockerroom. Doesn’t this usually stay in the lockerroom? Unless he asked JLin to say something to the guys. Nevertheless, to announce it to the Media. It shows Pierce has respect for Lin’s leadership abilities. Now, if that also translates into letting Lin lead on the court too, then it would really be something. The question is, how much does Travis Schlenk want to tank? Even tanking, I don’t believe ANY NBA player wants to be humiliated by that bad of a blowout. More J. Lin on DRose and how Rose’s story inspires him. Lin told the media what he said to the team. The post-game interview is posted. Wow, Lin is still feeling betrayed by the Nets. Lin would never divulge that aspect of how he thought he was the face of the franchise, unless it was true. Sean Marks. Trading Lin away while he was at his most vulnerable, for what, some crappy picks? This clinches it. The Hawks situation may not be ideal right now for Lin. But it sure beats playing for a hypocritical heartless organization headed by Marks. The epitome of why I HATE THE NBA. Would be nice but still not a enough to beat Wilt Chamberlain’s 100 pts in one game. Yeah, I got teary eyed too. Definitely feel for the guy. Always uphill battles for him. But he PERSEVERES. To be respected and admired! Sorry. Lin needs more time for rehab. NO. Pierce’s interview came first. He told the Media. And based on that, the Media asked Lin about it. OK. I didn’t know the order of events. I think your feelings on it are probably what happened. I think disputes between players or players and coaches and more sensitive things stay in the locker room. I think what Lin did tonight is true leadership so LP felt it was appropriate to share and thought Lin was ok with it. They look like it. Worse than the Cavs. man, just glad Jeremy had a player option this year. if it was a team option, he wouldn’t even be in the league this year. gotta give props to his agent for getting this 3rd year option with the Nets a couple years ago. hope Lin continues to stay aggressive and earn that next contract. It’s great to hear LP said what Jeremy shared with the other guys was inspiring, talking about the spirit to have a joy in playing after being out 2 years. Hopefully, the other guys are inspired to play with more togetherness. Lin’s strong game and leadership definitely would be keys to inspire his teammates to follow his lead. Can’t wait to see what might happen in the next few games. Either the Hawks start clawing teams or they continue blowing 3rd quarters. still believe this is a tanking team. LP came here from Philadelphia so he knows all about “trusting the process”. Prince got the height and can shoot when he’s on the streak and playing off ball not iso. Bazemore just looks out of shape and unable to do much. He can get to the rim but hasn’t been able to do much besides preseason. Coach should just bench him, shouldn’t sacrifice the team just to show case Bazemore. I like Jeremy. I really do. Even as a tanking team there’s no reason to play Lin over the young players. Nets and Lakers both limited Lin’s minutes and offensive abilities or benched him. The fact that Hawks and coach are treating Lin decently is a great surprise. Either Hawks does see Lin as part of their future or they are show casing him for a mid season trade. I’ll take the minutes and freedom given. the only thing that will convince me that this team is not tanking is if they play Lin 25-30 minutes a game with high usage rate. Marks and Joe combined, never trust GM or business owners. Anyone can be traded no matter how great you once were. D Rose is a great example of MVP turned vet min player, no one cares once you’ve loss your athleticism and scoring ability. Paul George was also never the same after breaking his leg during USA team training. Hawks aren’t going to bench Trae Young and honestly he isn’t the one who should be benched, Baze and Prince are playing selfish and wasting possessions, one of them has to go and it’d be Baze. it took a little longer. i would say lin’s back. for those complaining about his 3 point shooting, lin’s never been a great 3 point shooter (and never a volume 3 point shooter) and it is not in his interest in terms of stat pumping (which is what he should be concerned about, not volume but precision)–or any other terms to be volume shooting 3’s. oh by the way jeremy lin espn “player of the game” for hawks (as he was in the preseason game where he scored 20). dyk (speaking of which) that per minute lin is taking as many shots this season as he did during linsanity? (so people should stop telling him to “shoot more”). bottom line: last two games lin looked a lot more lin-like. I’m sorry, but Lin is wrong. Either Lin doesn’t want to cause controversy and say something bad about Rose, or he simply hasn’t been paying attention to Rose the past few years. Because Rose did quit… several times too. He ditched his team and teammates to “take time off” in the middle of the season. I think Pierce is starting to realize that he needs someone like Lin to help him coach, lead, and inspire this aimless young team. If Pierce trusts Lin to be his floor general and veteran leader, good things will come out of it, for everyone on the Hawks. This Hawks team had no leader last year and they still doesn’t have a leader this year. Trae can 1 day be that guy, but right now, he’s not close to being ready. It has to be Lin and it has to be a healthy and engaged Lin. Pierce is finally giving Lin more consistent playtime, which will lead to Lin being more engaged and vocal, as well as playing better. Fox got a triple double. Now you either blame Lin or Young. Take your pick. Both and the Team defense as well. Today’s game was the fastest pace Hawks has ever played thus far…hence they were not prepared for it. It would definitely a good learning curve and future preparation. Lin’s IQ is off the chart. Bazemore + Prince is OK but when you throw in Young, You can’t see any discipline on the court but scoring. You need to score more than your opposition and that calls for effort to defend. Lin meant staying in the NBA as not quiting. We don’t know how difficult the situation is so can’t really judge. No one thought Rose would ever play the way he did again. He was a far better player than Lebron, but had two season ending injuries that killed his career. Rose was no.1 favorite player over Lebron and Kobe in China before his injury. Rose was not a far better player than LeBron ever. LeBron, like him or not, is one of the best players ever. Some say, the best. I think Lin is looking at it from a back from injury perspective. Rose certainly just disappearing and not contacting his team was beyond unacceptable. His shooting form has been smoothly transformed. Once his game rhythm fully back, his 3p will surprise many other people. Didn’t Rose have some sort of legal problems? Lin is back to the radar. Now we just wait for LP if he will continue to give him playing time. If that happens, trading to another contending team is likely. 23 points in 23 min. That’s crazy efficiency. And he’s not 100% yet 🙂 A good day to be Lin and his fans. Lin is a smart cookie. He has figured out that he needs to lead the young Hawks by example. He’s shown on the floor that he can be the #1 scorer and play great defense at the same time. You can almost see the respect is growing incrementally with the high-fives after Lin beat his man to the rim, got fouled, got back up, and drained the FTs. No doubt he has garnered respect as a leader in that locker room last night and earned the right to talk to the team about the joy of playing basketball after being out for 2 years. I agree if Lin’s performance keeps trending up as it gets close to the Feb trade deadline, playoff contenders would definitely call the Hawks to check for Lin’s availability. It’s a good sign when @ATLHawks starts showcasing JLin’s resurgence and his efficiency. ATL walks a fine line to balance wanting JLIN to show some flashes of performance to boost trade value but also not have the fanbase agitate that JLIN should start over Trae. JLIN appears under no illusions this season – the PRIZE – is a new contract with a different team. JLIN is executing part a) and hopefully part b), who knows about part c). are there people agitating for Lin to start outside of Lin die hard fan? I do feel Loyd Pierce should shake things up in the starting line up. I have “agitated” though not strongly, for Jlin to be the #1 PG in ATL, TY to lead the bench. After 20-30 games, when Jlin has acclimated to the NBA again, then I will likely “strongly agitate” for Jlin to be the ATL PG. I will especially agitate if TY is still inconsistent (highly likely as a 19 yr old rookie) because I think Jlin’s particular skill, that of making others better than they are, would be very strongly evident with this young ATL team. Jlin at PG will also allow young TY to play against the other team’s 2nd string and work on his defense against #2 PG for the other team and also allow him to use his offensive skills against the 2nd unit and help improve his confidence. If ATL does make Jlin the #1 PG then the play of Bazemore, Len, Dedmon, Prince et al will greatly improve. 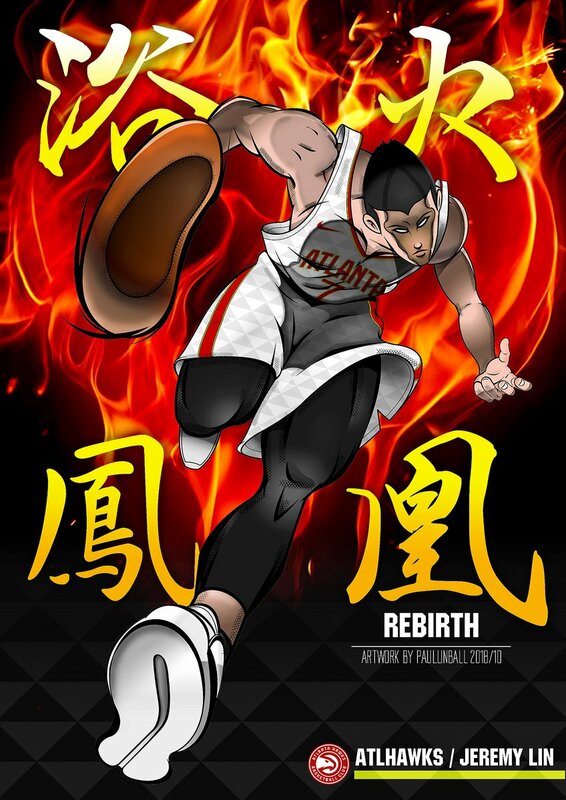 If this move to Jlin to #1 PG develops as I think it could, then the fanbase won’t care whether or not TY starts or not because ATL will win basketball games! My whole point is that they don’t want JLIN to perform too well because that risks undermining the entire ATL tanking strategy which is far more important that raising trade value on JLIN. Because if you start JLIN then many of these Losses will turn into Wins – Atlanta can’t let that happen. Of course I agree with you completely … unfortunately Tanking and raising new franchise face of the team TY is more important than winning for the Hawks this season. A great game by Jlin as individual but the fact is ATL got BLOWN OUT! TY got triple-doubled by a 2nd year PG! After Jlin gets fully acclimated to NBA action then his elevation to #1 PG will result in the team doing better and winning games! From preseason I’ve noted that TY probably does not have the ability to defend in the NBA and unfortunately he’s proving this to be the case. TY is simply too small in stature (height & weight) to be effective against ever larger starting NBA PGs. Every point that he scores (as he stores up his energy while not playing tough defense), he gives away in easy buckets for the other teams guard… it also doesn’t help that he is currently a turnover machine. You raise a good point that TY could be subject to significant mental stress allowing opposing players light him up every night, but nobody knows what this kid is all about — for all we know he also doesn’t care about wins or playing defense as long as he gets his touches and his points. It’ll be interesting to see what will it take to make Lin to be a starter. I think ATL will try to showcase Bazemore for trade so he’ll need to get minutes as a starter. The same can apply to Lin if they want to showcase him in December timeframe. I’m not sure if ATL wants to bench Trae since it might affect his confidence. They might keep the same lineup for the first 20-25 games to see how things work out. 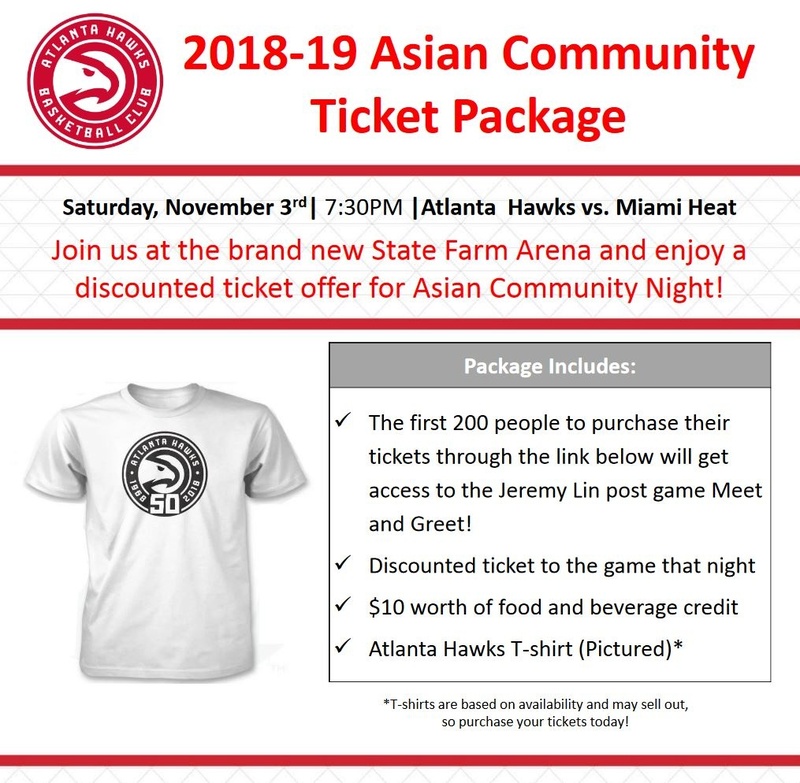 The Hawks are holding an “Asian Community Night” at tomorrow night’s game. Jeremy will have a meet-and-greet. The truth is this team needs Lin in a desperate way. No amount of coaching will make it through the thick skulls of elite athletes until someone shows them in real time why plays are designed the way they are. It’s almost a quantum leap to jump from single layer linear thinking to understanding multi dimensional timelines that begins with a pass and cut. More often than not, players run patterns blind without appreciating the possibilities inherent within a system. It’s like a musician that plays music note for note instead of a performer who feels the beauty of interaction between the music, the audience and the band. To play bball beautifully, you have to feel the energy of the floor, the momentum of time signatures and the intersecting paths of players within the movements. Linsanity is the only time anyone gave Lin a chance. We all thanked MDA for giving Lin that shining moment. The truth IMO is that MDA didn’t make Lin great, it was Lin that made MDA look like a genius. MDA trying pound in his ideas for at least 3 years of futility from 2008-2012. Enters Jlin and all of a sudden everything clicks. This ever so subtle skill Lin has enables him to lead ragtag groups of players to play way above themselves. All they need to do is allow him to lead them. 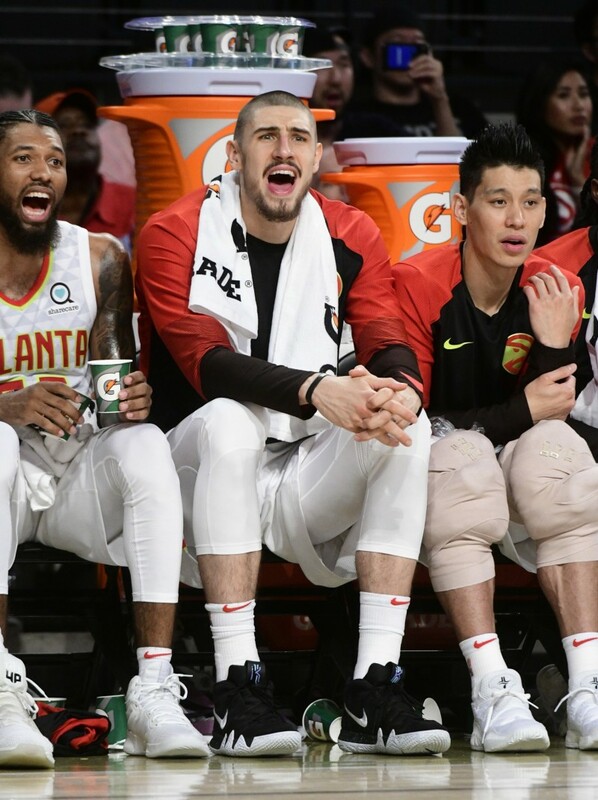 The Hawks need Lin to turn them from a bunch of individuals with talent, to a team of supporting members that hides their weaknesses by numbers while accentuating their own individual strengths. Lin can make that happen. We’ve seen it and there’s a name for it. I’m always uncertain about internet basketball fans vs. those that go to the stadium. Most internet Hawks fans want the team to tank, trade all veterans for picks and really don’t care if Atlanta wins or not. So they see Lin as a few months player for the Hawks (and Vince and want Baze and Dedmon trade). They want to see Trae play as many minutes as possible as well. Some don’t care about anything but Trae. That’s what I picked up from the 4 Hawks team sites. He gets the most attention and comments. In all honesty, no. Some don’t even want to see Lin play much and want to see Lin play minimum minutes. There isn’t a lot of interest in Lin from what I’ve seen on Hawks boards. But, I think Lin’s talk yesterday has some Hawks fans appreciating him. And a few want to see Lin play along with Trae. But absolutely not one poster I’ve seen prefer Lin start over Trae. Lin, at some point, could be brought into the starting lineup. But I don’t think that’s as important as most posters. First of all Collins will make a difference. So Vince Carter will go to the bench. Second, you can always bring Lin in after 4 minutes in the game and run him with Trae. When he’s ready. But his 3s and defense have to come back more before that happens. Right now I do not think Lin is ready to start and I personally would not like to see him start, if he were to start, until sometime next year. Maybe mid-January or February. Im still going day by day and I need to see Lin go months and average 18-20 minutes before I feel he’s over the hump. Maria, my opinion is Lin has a chance to rebuild himself on the Hawks. We get to see him play. Next season he can choose where he wants to go whether he is traded or not. The Hawks have their own priorities, the main one is promoting Trae Young, and they have their own culture. Lin is likely there for part of this season or maybe one season. I want him to showcase his talent and if he can help this team win a few more of the very few games they’ll win, that’s gravy. But the meat of what I think is best for Lin on the Hawks is to get through the season or partial season with as few injuries as possible. And he has a wonderful trainer there to help him try to do so. very true, starting Lin will help the current starters who’ve been blowing the 3rd quarters consistently. The only puzzle is they can’t bench Bazemore if they want to showcase him. So they might have a small lineup with Lin shifting to SG and Bazemore to SF. That’s why it’s difficult to start Lin if they want to showcase Bazemore for trade and not bench Trae since he’s their 1st round pick. As long as Lin plays a lot of minutes and close games, it will be very good for him and playoff contenders watching him. He graced the cover of the Hawks website! Lead story! Lin at the Kings game yessterday – are those chunky things on his knees ice packs? I don’t know about y’all, but I am so PROUD to be a Jeremy Lin fan right now. Why is Jeremy in Houston, the place that didn’t believe in him just a few months prior and cut him? When he got marginalized, it was to be expected. But it was still sad. A trade. Great! Anything to get out of Houston. But hey, why isn’t Jeremy speaking up when the Lakers are tanking not just their season but his career? Just get through it and reset. Take the high road. And then Charlotte was fun, but it was only fun after being taken advantaged of in the previous two stops. In reality, when Jeremy was there, his real potential was capped. And then he got his chance again, and man… I thought it was time. His game was sharper, his skills were high, and he was finally again with a coach who believed in him. It was time until it wasn’t. For two years we got almost nothing. When Jeremy came back this year, I just wanted him to be happy. This is typically the tail-end of the journey. His story is one that has had more lows than highs, and I just wanted him to be happy. In truth, he looked very bad to start this season. I wondered if he would ever have anything left in him physically again. It wasn’t about lack of faith in Jeremy, it was about the doubt in his physical body. And it didn’t look good at first. I didn’t think it would look good for the rest of this year. Maybe ever. But he’s been getting back. He’s faster, he’s stronger, he’s more confident. The shift has been surprising. And this is all nice, but it doesn’t make me proud. What makes me proud is that this is the first time I’ve seen the spark of Linsanity again. Do you remember when Jeremy was about to be cut from the Knicks, booted from the league forever, and then he just said, “Okay… next chance I get. Whatever happens, I’m going to play my game.” And he did. And Linsanity was born. But that’s been gone forever now. I’ve never felt it come back until now. I’ve been waiting all this time. It looks like Lin is doing away with the reverse layup. Too high of risk for injuries? I don’t think I’ve seen one attempt, even in preseason. In the very first preseason game he played he used it. But he doesn’t seem to be using it as much. I think we’ll see it again, when he’s more confident in his body. ok, was trying to watch highlights and might of missed it. yeah, or hope he’s worked on his left coming from right to left, preventing him from twisting and landing while facing the rim. It was always a weapon for him, so if he can, great, if not then won’t miss it. I wonder what practice is like when TY has to guard JLin? That’s where you wrong, other than MDA’s PNR and multiple screens offense, Lin had not excelled as much since! Lin’s skills were there sure but he needed a great coach and a fitting offense and MDA’s was perfect. Not only that but MDA gave Lin the ultimate green light regardless of FO hidden agendas. No other coach not even Pierce has/will do that. Lin blindly followed every coach’s offensive scheme and request and it has only hurt his offense and stats minus his defense for Cliff. We could only wish Lin was reunited with MDA on another team but it’s doubtful unless Rockets implodes. The Prize could also be the Hawks depending on whether they’re going to offer him a long contract with starting role. Not even Curry was a star after draft, it took years before he invented a new shooting skill, extended his range, and fixed his ankle. Trae Young’s talent is no where close to Curry’s yet. He needs time to develop, he can start but having Lin starting along side will help set him up and make things easier. Not there yet defensively? Have you not see JLin make blocks and defense on almost every play? Lin is there defensiveely more so than his offense. Lin is ready to start, last game already proved he’s at least 90%, there’s no better time to start Lin than now. If that was the case, why give so many minutes to Lin in the first place? Lin’s minutes are increasing every game and it doesn’t look like Pierce is losing on purpose. He doesn’t have to with the starters playing so horrible. Hawks aren’t tanking at least not yet, they are however on a losing streak due to their selfish starters. Like I said, MDA had been with the Knicks since 2008 and he couldn’t make his offence work. It took Lin less than a week to turn that dysfunctional Knicks team around. We give MDA too much credit for Linsanity IMO. We’ve seen more than enough great games that Lin produce when everyone of his coaches accidentally let out of the bag, all of them under different coaches and systems. Let’s just say that they needed each other vice versa. It depends who Hawks want to sacrifice. There’s no need to showcase Bazemore as a starter, he can showcase as a bench player. Hawks would be wasting time for chemistry to develop by starting someone they aren’t keeping. And they reverted back to it not working after Melo came back. The main problem was Melo who disliked and wouldn’t listen or follow MDA’s plays. Not even Lin can save MDA from Melo going to the owner and kicking both of them out. That’s why MDA fought so hard for his system to run through Lin. He recognized how great Lin was and knew that he had found himself another Steve Nash. Exactly! If Hawks are tanking and don’t see Lin s part of their future there’s zero need to play him at all! They were true to their words when Lin said he was on injury protocol (limited minutes), and they were also truthful when saying Lin would play with Young. Now next step is whether they will start him. Bottomline, Lin needed MDA more so than MDA needed Lin. MDA got another coaching job after Knicks, Lakers, and regained his rep with the Rockets as no.1 seed. Lin on the other hand dropped off the grid and could’ve been out of the NBA for good if he couldn’t play like he used to. it isnt a question of mda or lin really – it was that mda trusted lin to play his own natural game. none of the coaches have ever trusted lin and it shows. they always mistrusted him for some reason – and that is why i will be grateful to mike d’antoni for that. So I checked out Peachtree Hoops twitter and articles. Also Brad Rowland twitter. WOW. Unless I somehow missed it, NOT ONE WORD or ONE TWEET about Lin last night, not during the game, and not even mentioning his highest score on the team. And definitely NOTHING about his lockerroom speech. To be fair, PTH doesn’t post ANY of the postgame interviews with other players OR even Lloyd Pierce. I suppose the silver lining is at least they are not actively bashing Lin. But I have never seen such a weak fansite on SBNation. (Even At the Hive was much much better.) And it seems like the same ten or so posters who make multiple comments. The other posters are known-Lin fans who moved there from the Nets. To the eye-test, JLINPORTAL has many more interesting posts from lots more posters. KUDOS to you all! How does GSW do it? Aside from the core stars and Iguodala and Livingston. Every year, they cycle through the other positions with new players. Bogut, Pachulia, McGee. David Lee, Harrison Barnes, David West. Matt Barnes, Nick Young. Ian Clark, Patrick McCaw. Last year was Jordan Bell & Quinn Cook, who both played well in the playoffs. Tonight, they barely played. The latest new contributor? Who is this guy Alfonzo McKinnie? Is it because GSW have great scouts and a great front office? Because they have a great system that they can just plug people in? Or that their CORE is sooooo good, that they just make everyone around them play with more energy and effort? Because they are unselfish and share the ball? So, Hawks to become GSW East? I don’t see it yet. GSW just toys with other teams. The other teams sometimes hang in there and think they have a chance. Look at Knicks, Nets, Timberwolves. It’s very rare that all of them are off for the night. More often than not, it’s just a tease. Don’t blink. When they need to, they just ramp it up. Yet they make it look easy. They are Team only Fans. And the team lost 31pts to the Kings. And Lin’s number is from garbage time. On another note, CP played THIRTY-SEVEN minutes to barely beat the Nets. Wonder how he will last until the end of the season, or the playoffs. Just looking at box score, Joe Harris had a super-efficient game. Imagine if he were on the Hawks playing with Lin. He’s having a nice season. He may have taken Crabbe’s spot. Lin’s 23 points, 13 of them were NOT from garbage time. Regardless. If they want to, they could report that as such. Their write-up included Tyler Dorsey! Even if Lin is not part of long-term. He is STILL currently on the team, playing a significant role. Not that I’m losing sleep over it. As a blog site, they have no impact on Lin. It’s just STRANGE, to completely ignore Lin as if he doesn’t exist on the team. I watched the game. There is no other facilitator. Melo played pretty well. CP3 didn’t allow him to ball hog. CP3 has exceptional handles and is a very good shooter. And he’s a tough defender. Harris is solid. Tougher than Crabbe. Crabbe has been struggling. OT and about Lin’s old team, the Nets. KA has been benching DLo in games in favor of Dinwiddie. DLo didn’t play the whole 4th quarter against the Rockets. Same thing happened in the last game. But in this game Dinwiddie didn’t play well. I would say KA hasn’t treated DLo fairly and has benched him too much and kept him on a very short lease. Not that I care for DLo, I’m saying this objectively. CLV is the closest thing to Lin. A humble but fierce player on the team. A religious guy. A guy that penetrates really well. He’s having his own sort of CLV-sanity. He scored, I believe 28 tonight and has had a bunch of games scoring in the 20s. He’s the most dynamic and fun player to watch on the Nets. Is he as good as Lin? No. But, he’s somewhat similar. But getting back to the D’Angelo Russell, he is not being treated like a star by KA. CLV is coming closer to becoming the franchise of the team. And this is something I saw developing from last season. It was terrible of that site not to mention Lin, both his game and his locker room talk. I have to say the GM Hawks site is very inactive and boring. There’s not much on Lin there, but there’s not much of anything. Yes. Not the first time we’ve seen him with these. Also other players too. So, hope he’s okay. That it’s just normal icing. For all the advances in science, don’t know why these ice-packs still seem so rudimentary. Nothing more convenient and comfortable? There is a video somewhere of the Warriors in the lockerroom in ice baths for their legs and ankles, soaking in those big old plastic picnic ice chests. Very funny. Nice pic. The Hawks fan sites are not up to par. Just not a big basketball market. But at least for now, the Hawks official site and social media, and Fox Sports Southeast, have all been appreciative, and acknowledge what he brings to the team. There you go again. Another beautiful analogy! And in a team sport like basketball. When the ball moves unselfishly, and finds the open guy, it really is like a harmony. GSW (and the former Spurs) do it so well. During Linsanity, when Melo was out, all the Knicks (and when he came back, even Stoudemire), even Tyson Chandler, a veteran and champion, bought in. Even though Lin said he never even practiced with those guys, he was able to lead them to play at another level. But it’s also true that MDA empowered Lin to go ahead and take over. The same way that Lin felt empowered during the Brook-Lin season. After he came back from the hamstrings, he led the team to start winning. That’s the tricky part. Will Schlenk and/or Pierce empower Lin? Do they really want to try to win? Will guys like Bazemore, Prince, and Bembry be willing to buy in? Seems like Pierce has endorsed Lin’s leadership. We’ll see if it translates onto the court. I don’t think it’s a question of mistrust at all. I think McHale, BS Scott, Clifford, ALL definitely knew what Lin’s talent and strengths are. The problem was they were all puppets of Front Office agendas which marginalized Lin. I think Kenny for sure trusted Lin to be an extension of himself (the coach), to be floor general. The Nets problem was Kenny’s system, which did not necessarily cater to Lin’s strengths. Despite that, the 37 games that Lin played were all pretty phenomenal, even when the Nets lost. Agree. Lin is Lin. His strengths in the PnR, his court vision, his ability to find open teammates, to get others involved, to attack in the open court. His efforts on defense. Only injuries, and AGENDAs, have only ever slowed him down. Apparently MDA didn’t fight hard enough. He resigned instead of waiting for the Knicks to fire him. To a certain degree, I think MDA did kind of quit on Lin. We’ll see how much MDA will really end up accomplishing. And Lin being potentially out of the League is due to injuries. Not because he didn’t play for MDA. It’s a nice package. Hope Lin will be able to play good HEALTHY minutes for those fans. ANYONE ON THIS FORUM FROM ATLANTA? And will be going to the game? At least the Hawks are still publicly supporting him. Well, at least marketing him. Timing is everything. He’s so good at it. With the Nets, I remember he blocked Curry, Taj Gibson, Al Horford, etc. Great defense! Kenny Smith always gave Kudos to Lin. TNT showed what Lin scored. But really didn’t discuss the game. NO MENTION of Lin’s come-back from season-ending (and even career ending) injury. As usual, just entertainment, not sports analyses. They wasted more time talking about how to fold stupid sheets. Clowns. More humor from Kevin Chouinard about the bad game from the Hawks. LOL. Already posted in previous thread. But just want to say again what a beautifully written and heart-felt article interview of Lin, by Howard Megdal. Why aren’t these POSITIVE articles retweeted and re-posted all over? Wish there was a way to reward these types of writers and articles. (Just like Chris Baldwin.) I guess the only way is to click on the articles a lot. Here’s Howard again: (guess this was tweeted before the blow-out? lol. From the Cavs game, another Vintage Lin attacking in transition. Need teammates to run with him! More of these assists please! At this moment, Lin is out of shape and it will take time before he could play starter minutes. So Trae Young starts for the team. We all know he isn’t a qualified starting PG with obvious weaknesses in defense. Once the defense in the 3rd quarter tightens, the Hawks would be blown out. Lin is not there yet. His 3 point shooting is not what he used to be but he knows how to make his shooting click but his body is not in sync with his mind; not now. I am OK that Lin starts from the bench getting himself back in shape ad long as he’s given decent minutes. Time is on his side because Young is the starter and not him. Maybe a month from now, Lin will get his body back in coordination shaking off the rusts of almost 2 years. I want Lin to take his time because winning is not his priority but full rehabilitating is. He will be back stronger and faster after every month from now on. Looking forward to the all star break because Lin can seek help from Doc. Our boy is coming back and is under control, surely and confidently. Our man times his play perfectly just like his shot blocking; against a seven footer, you bet! Come on. MDA was made to resign. His other alternative was to marginalize Lin in favour of Melo. MDA has fought to play Lin the right way with his resignation against Melo and company. How much more that you want a coach to do for his PG? DLo is too expensive to keep after this year. Anyway, Nets has to decide which PG to keep after this season. Dinwiddie is going to be a free agent and DLo’s qualifying offer is high. If I were Atk, my vote goes to Dinwiddie and trade DLo for whatever the team may get out of him. Sean Marks should be fired when his contract expires. GSW has had great scouts and some of them has gone to Atlanta. Most of the Team only fans were under the control of the team. This message is what Lin is telling his teammates. Simple and clear. The owner made a choice to force MDA to run offence through Melo. MDA put his foot down and said no. He resigned because management didn’t want to run the team his way. Ever since, the Knicks has had only one good season and many bad seasons after that. Hope Atlanta Asia community will support Lin there and show up. Hey, Willie Cauley-Stein is a 7′ center! Do you want to see Charles Barkley now after Derrick Rose scored 50 in a game! I love to see his twisted face. I till remember a blind pass from Tyson Chandler to Lin during one of the later games of Linsanity. You can see how everyone was in synch and the ball zipped around so effortlessly. EVen Melo was into it. The blind pass from Chandler was an awkward double handed over the head pass to no one. Lin never expected it and hesitated in his movements. The ball bounced on the floor right behind Tyson. Once Lin saw what was happening, he ran the cut and picked up the ball on one bounce for a nice play. It could’ve been a turnover instead but Chandler saw in his mind the permutations of that moment. THATS THE LIN EFFECT. You can write down my word. Walton will be fired. King James does not like non-African American coach. I did not watch any of the Lakers’ games, but after following NBA for so long, I would not be surprised James loss purposely to get a coach he desires. When Magic Johnson and Lebron starting collecting that ecclectic group of veterans (Rondo, Lance Stephenson, Javale McGhee, etc) this summer, everyone was scratching their head about what Lakers were doing. Then after few regular season games, I saw former players who are now commentators on tv talk about how interesting what Lakers were doing (thought I haven’t read any good articles about exactly what this is). Lebron may not have patience to wait for Luke Walton to continue developing as a coach, or it could just be that Walton is a motion offense type coach ( https://nba.nbcsports.com/2015/02/25/hawks-see-their-offense-as-evolution-to-defeat-modern-defenses/ ), and that is not direct Magic Johnson and Lebron want to take team. Time will tell, though we probably have to wait till playoffs to really make good judgement on whatever happens with all this palace intrigue inside Lakers storied franchise. I guess Marks can’t afford to prove a point in DLo anymore. A team which would rather hype a “star” than win attracts similar fans. Roster of the Hawks is very interesting as far as age is concerned. You can separate them into 3 classes of players. Since the team may have 3 first round draft choices, 3 players of this team this season will have to be gone to make room for them. I have marked those players with an *. To maintain the competence of this team, most of the elders are either still under contract or too valuable to be let go. I would assume that Travis Schlenk will renegotiate with Lin for a new contract if Lin keeps on improving this season. Similarly Dewayne Dedmon will also be kept. Of course, there are people who think Kent Bazemore will be traded but I really don’t think so. To keep his job, Travis Schlenk needs to have a roster that can help the team win more games. Rookies are always bad. They just couldn’t win games by themselves. You don’t have to agree. But this team needs older players to close games that young players couldn’t on a night to night basis. They were different. Lin is a 23 year old blocking Rose. Lin in the latest block is a 30 year old coming back from an injury where he had to relearn how to walk. And against a 7 footer. Both are equally impressive for different reasons. Bazemore is a good player but anyone who has to play with Young may suffer..
After Lin’s locker room pep talk, tonight’s game could be a start of something good this season. Hope the players rally around this moment and truly “play for each other” as Lin “preached”. If what you say were true, that Lebron does not like non-African American coaches, then he is a racist, though I think he disrespected Ty Lue too. Not a conmentary on jlin, but I highly doubt it but i love ur optimist! it will have some impact, at least….. I think there are alot of guys on roster who, like Lin, know they are going to traded for draft picks eventually, and they probably would prefer to start with Lin, in order to increase their individual trade value. I agree except for Carroll. He’s the closest thing they have to a vet leader that the Nets absolutely need. He also provides toughness and offense on the team. They miss him. We have to remember that there were no ball-dominant players during the first stretch of Linsanity. Once Anthony came back, after a few games, almost everything fell apart. Then he played with more ball-dominant players from Harden to Kobe. They were also media-attention players and faces of the franchise. Kemba was an established PG and pretty ball-dominant but Lin had a different role in Charlotte. On the Nets, Lin was called the quarterback in a system KA hadn’t solidified. But when he played with Lopez, he mostly ran the show. So, I see the GM/organization/media focus on another player almost everywhere he went except the Nets. Now he’s in the same situation. And Prince and Bembry are sort of ball dominant while Trae has potential to share some things with Lin when they play together. Still, in that situation, Trae is PG and Lin is off ball. Exactly. At least be competitive in the 3Q. Maybe LP can figure something out. Change the lineup quickly if the “starters” falter in the 3Q. Now he is trying to get Walton fired. The handwriting is in the wall. AND IT LOOKS LIKE THEY DID! Nice to see! Learn something new everyday – thanks!